Noted Australian madman George Miller may have distracted himself (and amused us) with films like Babe: Pig in the City and the two Happy Feet toons, but now it's time to quit goofing around and get back to the dusty, post-apocalyptic wasteland that launched his career. Mad Max: Fury Road reboots Miller's cult-favorite franchise with all the intense, explosive energy you'd expect from a passion project that's been some 20 years in the making. Which is to say, it is straight-up, wall-to-wall bonkers. Not the story, mind you; that's actually pretty simple. In our ruined future, the Wasteland is run by a grotesque, misshapen tyrant called King Immortan Joe (Hugh Keays-Byrne), who has a harem of wives to beget his posterity, and keeps a tight rein on his subjects by controlling the meager water supply. 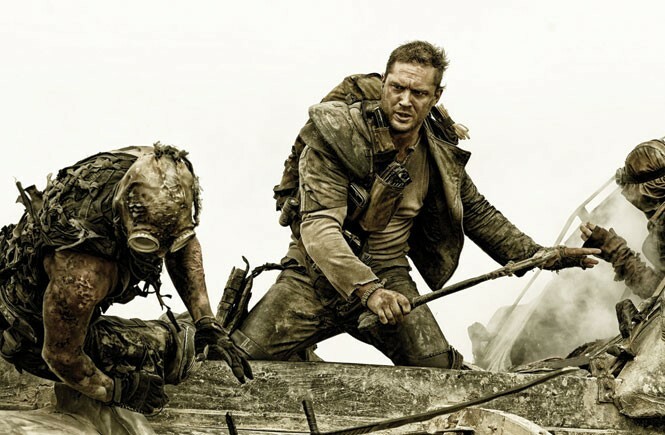 A loner named Max (Tom Hardy) runs afoul of Joe and finds common ground with one of Joe's own officers, a 1.5-armed badass called Imperator Furiosa (Charlize Theron). What follows is essentially a feature-length car chase, with Joe's ferocious albino kamikaze soldiers pursuing Max, Furiosa and their small band of survivors, both sides attacking each other without bothering to pull over first. Most of the battle takes place in, on and under the speeding vehicles, which are fortified with armor and essentials like flamethrowers and spiked tires. Amazingly, Miller paces the almost nonstop action so that it's neither tiresome nor hard to follow. No shaky-cam here; we see the spectacular stunts and choreographed fights in full clarity. The details of Miller's near-future world are a delightful hodgepodge of influences and traditions, hinting at a treasure trove of back story. That compensates for the present characters being merely serviceable rather than memorable—not that such things matter when you're staring goggle-eyed at high-velocity mayhem.